The Albright-Knox Art Gallery’s expansion project includes two new exhibition spaces, a buried parking garage and a grand new entry hall. The Albright-Knox Art Gallery plans to sink its parking lot beneath a restored public green space along Elmwood Avenue, radically reconfigure much of Gordon Bunshaft's low-lying 1962 addition into a grand public entry hall and create 23,000 square feet of new gallery space split between two new buildings that pay deference to the surrounding parkland. The preliminary plans for the placement and function of the gallery's long-planned expansion project, whose budget has nearly doubled from its original price tag of $80 million, are being announced by gallery officials in a public meeting in the Buffalo Niagara Convention Center on Wednesday. 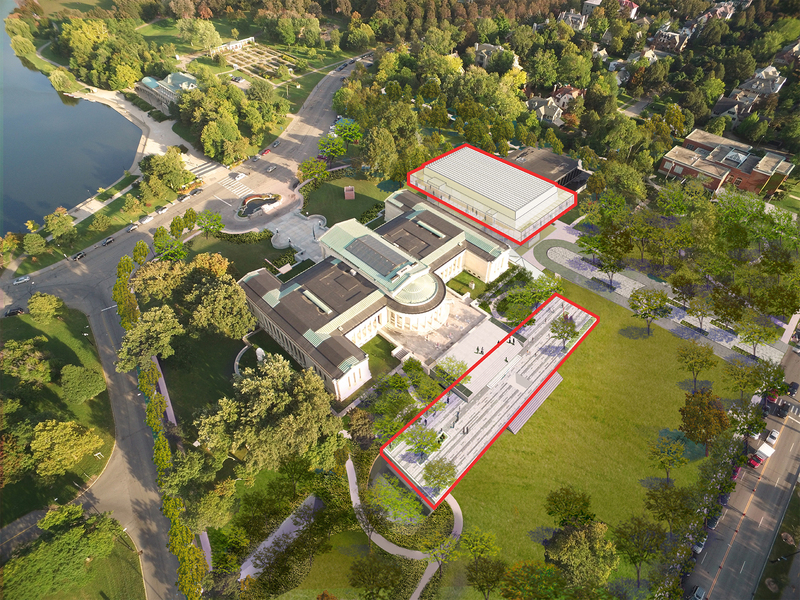 "The idea is to become one with the park," said Albright-Knox director Janne Sirén. Renderings provided by the gallery and its architectural partner OMA, which was selected last year to design the expansion, show the locations for two substantial pieces of new construction. The first is a 13,000-square-foot space with 16.5-foot ceilings floating between E.B. Green's 1905 neoclassical building and Bunshaft's glass-walled auditorium. 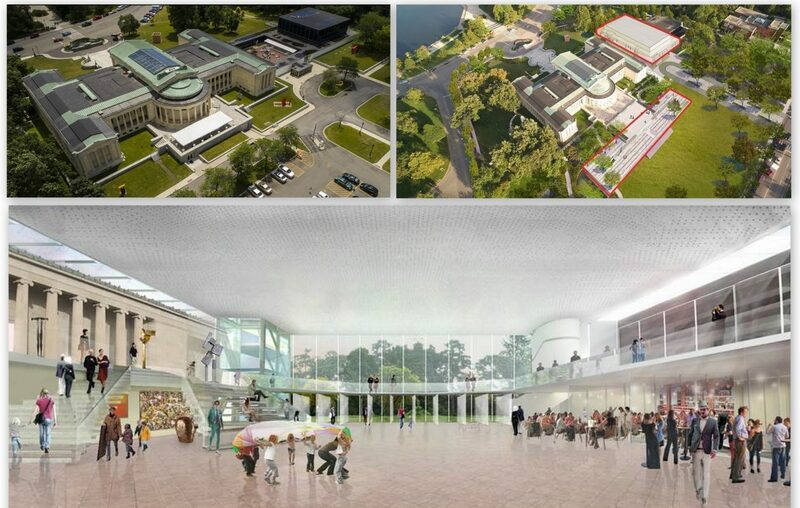 In conceptual renderings, the new gallery space has glass walls on all sides, providing elevated, 360-degree views of Delaware Park and the surrounding neighborhood. The second planned building is a structure containing a grand new staircase and 10,000 square feet of additional gallery space dug into the ground along the Elmwood Avenue side of the 1905 building. Adjoining the underground gallery will be two levels of underground parking, an expensive prospect that allows the gallery to reconstitute the section of Delaware Park now paved over by its parking lot. The landscaping of that space, along with the rest of the gallery's campus, will be designed by veteran landscape architect Michael Van Valkenburgh. In a forward-looking move, the two-tiered underground parking garage, according to Sirén, can eventually be reconfigured into about 20,000 square feet of additional gallery space in future decades should the demand for cars wane. Perhaps the most striking feature of the planned expansion is the creation of a vast, light-filled entry hall where the current courtyard and Bunshaft galleries exist. Renderings show the space as a glass-walled public plaza with an elevated walkway providing access to the existing auditorium on the south side and a new restaurant that will spill onto the east lawn of the gallery in the summer months. In much the same way as the Cleveland Museum of Art's modern atrium, it will create a juxtaposition of new and old. The southern facade of E.B. Green's 1905 building, now partially obscured by Bunshaft's 1962 addition, will be folded into a luminous interior space. That space will provide free, unfettered access to pedestrians making their way from Elmwood Avenue to the park and vice versa, serving "free public space, a town green, and a social gathering space for people and events," according to Sirén. "If you're a Buff State student parking your car on Lincoln Parkway there, you can cut through the welcome hall," he added. The proposed design also includes a new loading dock tucked along the northern edge of the campus, a new circulation plan inside the building and a 5,000 square-foot education center on the south side of the current Bunshaft building where works by Jackson Pollock, Frank Stella and Clyfford Still now hang. Sirén, who stressed that the renderings the gallery is sharing represent only what are called "volume placements" and not the shape or material details of the eventual buildings that will be designed, said that the expansion meets the goal of maintaining the gallery's current footprint without taking up any more of the surrounding park. "One of the things that I've puzzled with long before we had OMA," Sirén said, "is how would one build here without expanding the museum's footprint into parkland, yet allowing space for growth and at the same time building something that would become another pearl in Buffalo's pearl necklace of architects, from Richardson and Sullivan to Frank Lloyd Wright and Saarinen." The new design, led by OMA's Shohei Shigematsu and his New York-based team of architects and designers, attempts to solve this problem by eliminating the problematic parts of Bunshaft's building, namely its cramped gallery spaces and underutilized courtyard. Bunshaft's gallery is considered an important piece of contemporary architecture, even if many gallerygoers and employees agree that its somewhat claustrophobic design is not suited to the scale of much contemporary art. Even so, its radical reuse is likely to raise the eyebrows of preservationists. Importantly, the proposed design preserves Gordon Bunshaft's beloved glass-walled auditorium from 1962 even while radically repurposing its smaller gallery spaces to make way for a new public space. 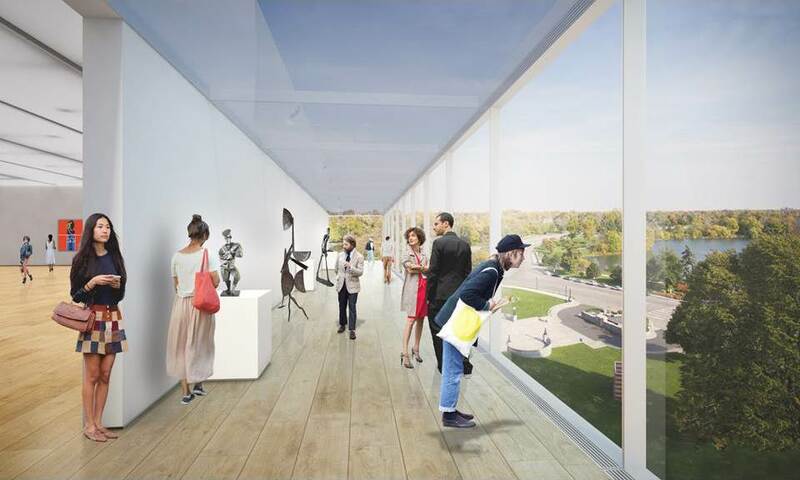 As depicted in the renderings, the new entry hall in some ways mirrors the one OMA and Shigematsu created for the Museum of Fine Arts in Quebec City. The gallery's Clifton Hall building, which it acquired in the 1980s, remains intact in the new design. The project, funded in part with an historic $42.5 million contribution from Buffalo-born billionaire Jeffrey Gundlach as well as $20 million in public funds, is expected to break ground in April of 2019, with completion expected by October 2021. Upon its completion, it will be renamed the Buffalo Albright-Knox-Gundlach Art Museum, in honor of Gundlach's groundbreaking gift and his desire to rebrand the institution as an emblem of Buffalo's revival. With a new fundraising target of $155 million, the gallery still needs to raise $30 million to meet its goal. Sirén said he expects that money to come from people with Buffalo connections from outside Western New York, though he did not specify who might provide the money.